For use as a topical spray, pour-on or foot bath. Zinc Sulphate vs Copper Sulphate vs Formaldehyde? 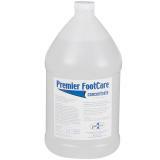 Zinc Sulphate (Premier FootCare)—we rely on it in a Premier SureFoot™ Foot Bath for mass treating and preventing footrot and/or foot scald. But it takes longer exposure time (10 minutes) to “work” than other options. Copper Sulphate—effective and quick. Corrodes metal gates (and even the nails and screws in wooden gates). 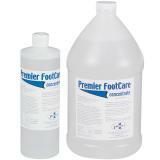 Thus we use it only for topical treatments like FootCure™. Formaldehyde—kills bacteria rapidly. Can make hooves brittle. Poses serious health risks to human and animal skin (particularly eye tissue). For use as a topical spray or pour-on for individual feet: mix 1 part Premier FootCare with 3 parts water. 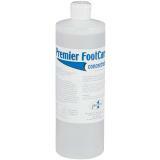 For use in Premier SureFoot™ Foot Bath: Mix 1 quart per 50 gallons of water. Change mixture every 300 head (more often if the sheep's/goat's feet are caked with mud or manure). Eye irritant. In case of eye contact flush for 15 minutes. If irritation persists call a physician. Do not allow sheep or goats to drink from foot bath solutions. Received the product very fast. We are spraying the cows hooves, since you can not get close to them. Do not know how well it works, since we only have been spraying them for the past 4 days. Hopefully we will see an improvement in them. We use this in a spray bottle. Easy to mix, we use it when trimming hooves, as well as treating sore foot. Great product. We have certainly seen improvement in our lambs hooves since we started using this product.